Much of the content below is drawn from an article by Rick Burnette, in issue 16 of Asia Notes (AN), entitled “A Toolkit of Resilient Agricultural Responses to Climatic Challenges in Tropical Asia.” Other ECHO publications referenced below include ECHO Development Notes (EDN) and various Technical Notes (TN). Smallholder farmers and agricultural development workers are reporting changes in climate. For example, during the 2012 ECHO Agricultural Workshop in Asia, 63 attendees representing at least 25 agriculture and community development organizations from across Myanmar were polled about their observations and opinions related to climate change. The vast majority of the respondents indicated that they were not only aware of climate change, but that they had also noticed change in the local climate or weather patterns. Climate change refers to any significant change in the measures of climate (e.g., temperature, precipitation, or wind patterns), lasting for several decades or longer (EPA Glossary of Climate Change Terms). While opinions vary as to the extent and causes of climate change, its effects are very real to smallholder farmers struggling to produce food in areas where droughts, floods and unreliable rainfall exist. With smallholders numbering about 1.8 billion, and managing 22.2 million square kilometers of the earth’s surface (Simpson and Burpee, 2012), small-scale agriculture is key to reducing hunger and mitigating against adverse effects of climate change. The world’s population is expected to grow from 6.7 billion (2011) to 9 billion by 2050 and surpass 10 billion by 2100 (UN 2011). Most of that population growth will take place in South Asia and sub-Saharan Africa (FAO 2010, UN 2011), home to many of the world’s poor (World Bank 2012). To keep pace with population growth, the FAO estimates that total agricultural production by 2050 will need to increase by 70% in comparison to 2005/07 levels (Bruinsma 2009). What could this mean in terms of crop production? In sub- Saharan Africa, by mid-century, yields of maize, sorghum, millet, groundnut and cassava are expected to decline by 22%, 17%, 17%, 18% and 8%, respectively (Schlenker and Lebel, 2010). A 14% decline in rice production is projected for South Asia by 2050 (IFPRI 2009). The degree to which these impacts are felt will depend on socioeconomic factors and investments in inputs such as irrigation and food imports. A basic understanding of the causes of climate change is important in helping farmers to adapt their systems accordingly. Natural causes for climate change include variation in the earth’s orbit, changes in solar activity and volcanic eruptions (EPA; Causes of Climate Change). However, since the Industrial Era began, humans have had an increasing impact on climate, particularly by adding billions of tons of heat-trapping greenhouse gases (GHG) to the atmosphere. When the earth receives energy from the sun, it then radiates much of this energy back toward space. However, the greenhouse gases absorb some of the outgoing energy and trap it in the atmosphere, creating the “greenhouse effect” causing the earth’s atmosphere to trap more heat. This, in turn, is changing the earth’s climate (EPA: Climate Change Indicators in the United States). Figure 1. Percentage of agriculture related greenhouse gases emitted by various, specific agricultural activities. Data source: FAOSTAT 2010. Sources of human-caused greenhouse gases are mainly energy supplies, industry, deforestation, agriculture, transport and buildings (EPA; Global Emissions). Agriculture is directly responsible for the release of 4.7 billion metric tonnes of carbon dioxide equivalents per year, comprised mainly of methane and nitrous oxide (FAOSTAT). Nitrous oxide is a product of the decomposition of organic matter (e.g., manure or crop residues) or the breakdown of nitrogen-containing fertilizers. 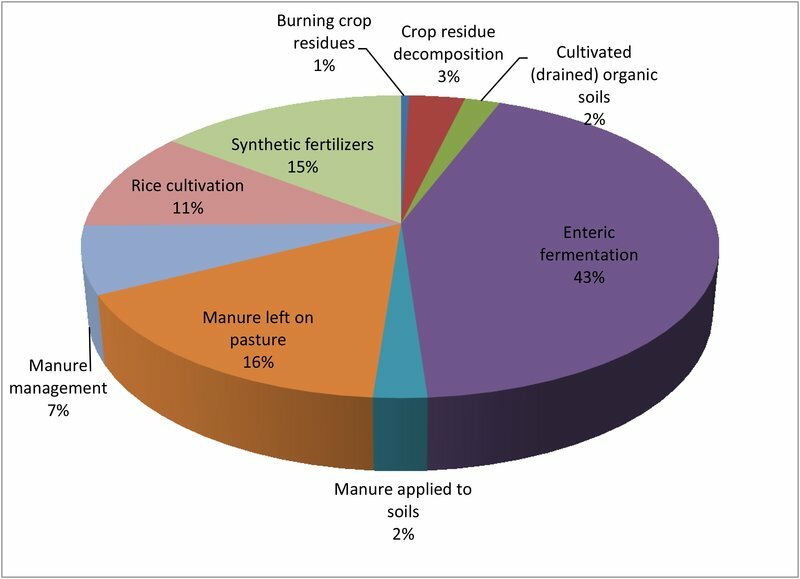 Methane is produced largely through the digestive processes of animals, as well as through anaerobic decomposition of organic material in rice paddies. Figure 1 provides a breakdown of the contribution of various activities to agriculture-related GHG worldwide. The result of trapped GHG is increased temperature. The Intergovernmental Panel on Climate Change forecasts a temperature rise of 2.5 to 10°F (1.4-5.6°C) over the next century (IPPC 2007). Why should we be concerned about higher temperature with regards to food production? Many crops, particularly maize and rice, are vulnerable at the pollination stage. Excessively high temperatures adversely affect fertilization and resulting grain yield. Summarizing data collected at the International Rice Research Institute Farm, Peng et al. (2004) showed that rice grain yield declined by 10% for each 1°C increase in growing-season minimum temperature in the dry season. In Mozambique, Harrison et al. (2011) added that earlyseason high temperatures result in earlier onset of the maize reproductive period, increasing the risk of heat and water stress to the crop. Increasing temperatures are also expected to result in more pronounced climate fluctuations, beyond what is considered normal. An MIT study estimates that with every 1°C (1.8°F) rise in temperature, tropical regions will see 10% heavier rainfall extremes - but even with rainfall increases in the wettest regions, particularly during the rainy season, drier parts of the tropics are expected to become even drier (O’Gorman 2012). This brief summary of the causes of climate change leads to the question, “What can be done, then, to help smallholder farms in developing countries during times of climate change?” Below we discuss principles along two lines of action. First, we discuss ways to mitigate against climate change itself. Secondly, we provide information on making small-scale farming systems more resilient to weather extremes. Agricultural and forest land can be used in various ways to enhance the natural storage of atmospheric CO2. Biological sequestration transfers carbon from CO2 in the atmosphere to biomass through photosynthesis, and ultimately stores it in plants (foliage, wood, and roots) and soils. When forests, croplands, and grazing lands sequester carbon, these sites are referred to as carbon sinks (Haile et al. 2012). The key principle, therefore, is to adapt farming practices that create these C sinks and, thus, minimize GHG. There are numerous ways to sequester carbon. Some broad approaches include building soil organic matter, planting or preservation of trees, establishing vegetation in areas prone to soil erosion, and the use of alternate sources of energy. As you read the practices outlined in the next section of this document, note that nearly all of them store carbon. In some cases, it may be possible for farmers to access and benefit from the carbon market. Progress in this area has been slow, possibly due in part to insufficient incentive. Nevertheless, there may well be opportunities worth pursuing that would allow farmers to be compensated for environmental services they render. Even with no outside compensation for doing so, farmers would be more likely to adapt their practices to climate-change mitigation if those practices also increased the resilience of their farms against weather extremes. Smallholder systems exist under a broad range of climatic conditions. There are some basic considerations, however, that apply in nearly every set of conditions. Productivity of both crops and animals depends on the availability of water and fertile soil. Where there is no possibility of irrigation, look for ways to harvest/collect rainwater, keeping it on the fields where it can infiltrate the soil instead of eroding valuable topsoil. Pursue any available options to improve access to water for irrigating small farms and gardens, using water resources as efficiently as possible. In terms of soil fertility, adapt practices that conserve topsoil, build soil organic matter, and maximize the efficiency of fertility inputs. Together with practices that guard water and soil resources, diversify crop selection and animals for resilience. Select crops and livestock breeds that are best suited to prevailing conditions. In deciding which crops are appropriate for an area, observe the annual and perennial plant species already present. Annuals are an indicator of recent weather patterns while the perennial species provide clues as to the prevailing climate. If the landscape, for instance, features a lot of acacias or palms, the chances are that the area does not receive a great deal of rainfall. Increasing food production is important, but it is also wise to consider other aspects of small-farm systems. How is the food stored and cooked? What fuels are used for cooking? These questions lead to considerations of alternate energy sources. There are ways, for example, to greatly reduce the volume of wood or charcoal needed for food preparation. Specific practices related to these concepts are discussed in the Practices section. Below, however, are additional concepts and principles to consider that pertain to specific climatic scenarios. Smallholder farmers in sub-Saharan Africa and tropical Asia are particularly vulnerable to less-reliable seasonal rains, frequent drought and land degradation. Increased soil warming leads to more rapid decomposition of organic matter, especially during the brief rainy season when there is enough moisture for a flush of biological activity. Unless that organic matter is replaced, soil structure breaks down, reducing soil porosity and water infiltration, leaving the land susceptible to erosion. Dry conditions suppress root growth, which leads to less soil cover and greater losses of topsoil to wind erosion (Swaminathan & Kesavan, 2012). Adapting dryland systems to climate change, therefore, necessitates efficient use of what little rainfall is received. The more rainfall that soaks into the soil, the easier it is to grow crops for human and animal consumption. Utilize drought-tolerant crops and crop varieties that produce the needed food and byproducts (e.g., grain stalks for covering the soil or livestock fodder) within the time span of short rainy seasons. Combining rainwater harvesting strategies with appropriate crop selection improves the likelihood of being able to produce the necessary biomass to maintain soil organic matter. Thirty-three percent of the world’s cropland is devoted to growing animal feed, and 26% of ice-free land is used for grazing (Pye-Smith 2011). Livestock production presents a number of challenges in the face of climate change. Converting forest lands to grazing land contributes to the loss of forests. Similarly, a significant portion of the annual soybean harvest–much of which is grown on land in Latin America that has been cleared of tropical forests–is used in animal feed. Livestock-related impacts on climate change are expected to increase as meat consumption is forecast to rise dramatically over the coming decades. Livestock breeds differ in their tolerance to heat. It may be possible to help farmers gain access to more heat-resilient livestock. Even if that is not feasible, there are ways to adapt animal production systems to better withstand extreme temperatures. Grazing strategies can be implemented that improve the capacity of lands to sustain livestock and sequester carbon. Livestock wastes can be managed to minimize nitrous oxide emissions and sequester carbon. Countries in which livelihoods are heavily dependent on coastal crop and aquatic production are taking climate change very seriously. An Intergovernmental Panel on Climate Change report projected a global rise in sea level of 0.6 meters or more by 2100 (Nicholls and Wong, 2007). Though there is a degree of uncertainty in long-term projections, these areas are already subject to tropical cyclones. For example, in 2007, Cyclone Sidr affected over 6 million people in Bangladesh, destroying 0.35 million hectares of cropland (ILO 2008). Croplands are destroyed through saline intrusion into water supplies, as well as soil erosion caused by heavy rainfall and storm surges. To reduce the vulnerability of coastal-based agriculture to inundations of seawater, diverse systems are needed that (1) efficiently utilize, as well as protect, available land and water resources and (2) provide alternatives to natural fish populations as a food source. As mentioned in the Principles section above, smallholder systems are diverse. Yet, there are some commonalities such as the need for water and fertile soil. Practices are suggested below that address these requirements in light of climate change. Water is often a limiting factor in extreme climates. Access to water, and subsequent delivery of water to crops, can be increased in the following ways: Practice: Construction of wells, small ponds or community reservoirs where there are no significant sources (e.g., springs, streams, lakes) of water already present. Pumps: Treadle, ram, rope and washer, or homemade PVC pumps are all ways to extend water supplies to crops in the field. Drip irrigation supplies water directly to the root zone of crop plants, minimizing wastage that often occurs with watering cans. ECHO’s bookstore carries Chapin Watermatics (now Jain Irrigation, Inc.) bucket drip kits, which have been used in gardening projects around the world. Practice: Use of appropriate farming systems to make the best use of available water resources. For dryland areas, consider a microcatchment approach such as the zai pit system. For areas with enough moisture to grow rice, consider the System of Rice Intensification (SRI). See the For Further Reading section at the end of this document for a list of ECHO materials on the zai and SRI systems. Strategies are also needed for coping with excess water that commonly occurs in low-altitutude, high rainfall areas or is caused by seasonal floods or extreme weather events. Such strategies could feature practices suggested in parts of this document dealing with preventing the erosion of topsoil and preserving coastal livlihoods. Figure 2: Example of Sloping Agricultural Land Technology. Photo credit: Mindanao Baptist Rural Life Center. Practice: Establish barriers along contours to reduce soil erosion. Consider the Sloping Agricultural Land Technology (SALT) system (Figure 2), which has been implemented successfully in the Philippines on steeply sloping land that receives high amounts of rainfall (TN 72). The SALT system has also been implemented in dryer regions; the spacing of trees established along contours can be modified to match water availability. See ECHO TN 55, “A-Frame Level,” for a simple technology to mark contours. Practice: Minimize soil tillage to prevent soil losses to wind and rainfall, as well as to preserve soil structure and ecology. Practice: Use plant residues as mulch instead of burning them. Organic mulching sequesters carbon, keeps the soil covered, moderates against soil temperature and pH extremes, and maintains a moist environment conducive to microbial life. Burning results in a quick release of minerals to the soil and quickly disposes of forest vegetation cleared for crop production; however, a significant quantity of minerals is volatilized and lost to the atmosphere, leaving the soil exposed to the sun. As much as possible, look for ways to utilize cut vegetation as mulch or compost; see AN 4 for information on ways to use rice straw instead of burning it. See TN 71, “Foundations for Farming,” for information on a conservation agriculture system that emphasizes keeping soils covered. 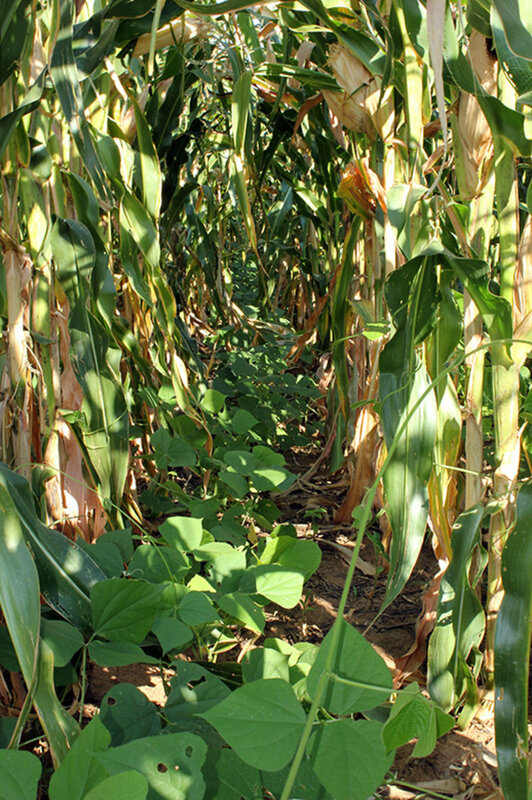 Practice: Incorporate green manure/cover crops (gm/ccs) into farming systems. Growing gm/ccs is a way to not only sequester significant amounts of carbon but also to build up a reservoir of organic matter that steadily releases nutrients to crop plants (ECHO Best Practices Note 1). Roland Bunch’s book, Restoring the Soil, outlines numerous systems in which gm/ccs are used in smallholder agriculture. Steps to improve and maintain soil health should lead to increased crop yields. It is possible, however, to achieve even greater resilience by growing crops with traits that help farmers to obtain reliable harvests under marginal and unpredictable growing conditions. Water demand: In terms of grains, millet and sorghum are more drought-tolerant than maize, with millet being the most droughttolerant. Even within crops, there are varieties with varying levels of drought tolerance. Local land races are often very drought tolerant, and some open-pollinated varieties and hybrids have been developed especially for drought tolerance. Ability to scavenge nutrients: Deep-rooted plants can access nutrients deep in the soil and deposit them back on the soil surface through leaf litter or prunings. Lablab bean (Lablab purpureus), for instance, has roots that can extend as deep as 2 meters, essentially placing organic matter deep within the soil profile. Early Maturity: This applies especially to annual grain crops and vegetables. The advantage of early-yielding crops/varieties is that they produce a harvestable product within short rainy seasons. Resistance to pests: Plant pest and disease pressure is generally greater in warm than cooler climates. Many varieties of grains and vegetables exist that have been selected especially for resistance to plant diseases. Again, consider perennials, as they are often quite resistant to insects and diseases. Practice: Facilitate seed fairs as a way for farmers to exchange seeds and increase availability of resilient crop varieties. See the For Further Reading section for a number of documents related to seeds. Figure 3. Example of flow-thru digester for biogas production. Development workers can assist smallholders to lessen dependence on GHG-producing fuels. Practice: Promote appropriate renewable energy (e.g., solar, hydro). Practice: Promote technologies that make local biomass fuels (firewood, crop residues, charcoal, etc.) cleaner, more efficient and accessible. Biogas can be generated in simple barrel systems (Figure 3) and used to cook food and provide light (see ECHO Technical Note 44, “Methane Digesters”). Farmers in dry areas such as sub-Saharan Africa and tropical Asia are especially vulnerable to unreliable rains, frequent drought and land degradation. Here we suggest specific practices related to rainwater harvesting, soil conservation, and the use of drought-tolerant crops. 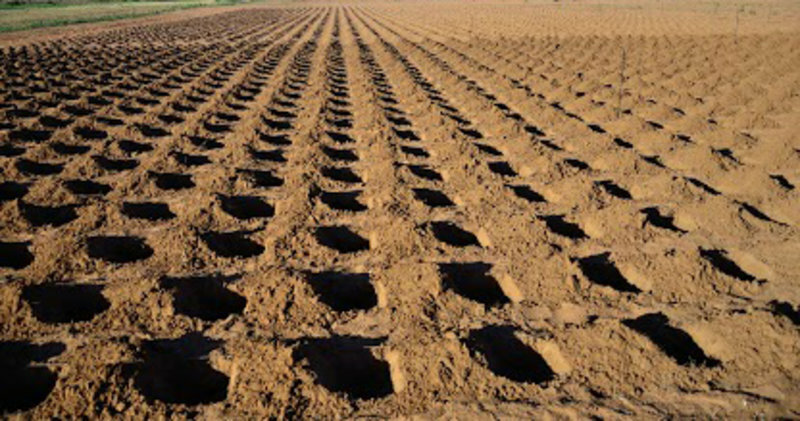 Practice: Dig small depressions in the soil, into which manure/fertilizers are placed and seeds are sown. This approach has been successful in dry climates. The small planting pits serve as water-catchment basins. Rainwater harvesting through microcatchments is a key element of systems featuring zai (Figure 4) and half-moon basins. Practice: Construct barriers along contours to reduce the amount of water lost to runoff and increase water infiltration into the soil. 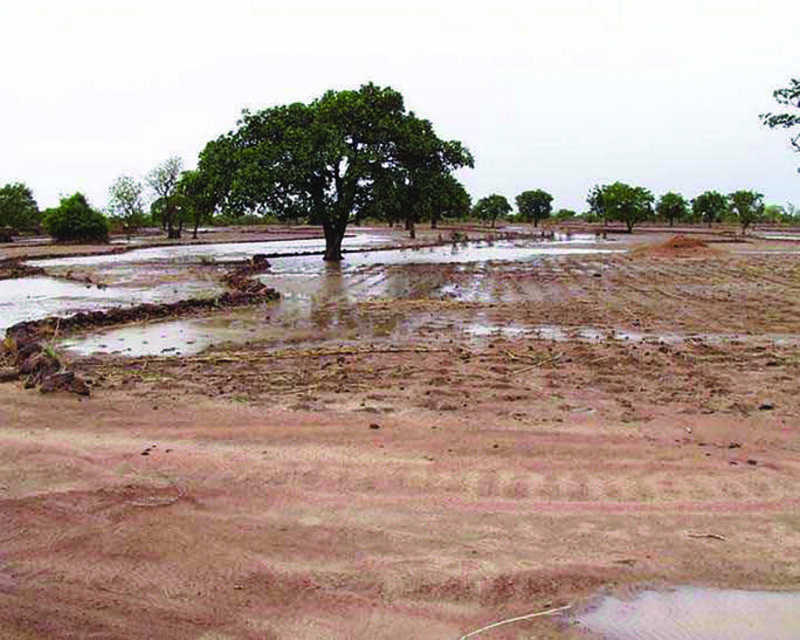 In dry areas of West Africa, stone bunds are often combined with the digging of zai pits (Figure 5). Figure 4. Zai pits, spaced 75 X 75 cm, in ECHO research plots in South Africa. Photo by Brandon Lingbeek. Figure 5. 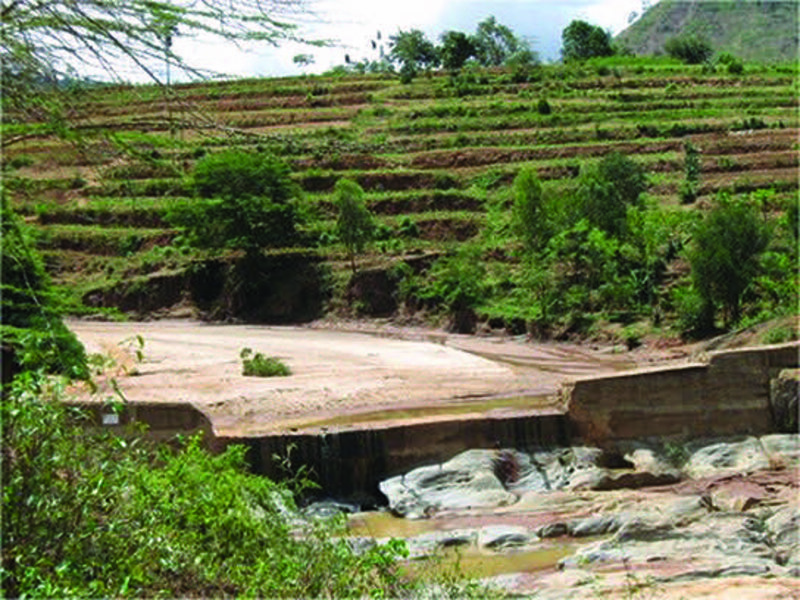 Stone bunds used to enhance the water catch-ment capacity of zai pits. Photo credit: Chris Reij. Practice: Where feasible, build sand dams (see photo on first page); these structures have proven effective in East Africa for retaining water with minimal losses to evaporation (See TN 70, “Water Harvesting through Sand Dams”). Soil conservation is critically important in dryland areas where the land experiences brief but torrential rains and is often depleted of organic matter. Figure 6. Lablab intercropped with maize. Practice: Incorporate gm/ccs into farming systems to build soil organic matter and as a means of protecting soils against erosion. Below are suggestions as to specific crops to consider. For more information about gm/ccs in Asia, see “Sustainable Upland Farming: The Use of Green Manure/Cover Crops for Relay Cropping in the Permanent Hill Fields of Northern Thailand” (ECHO Asia slide presentation). Additionally, ECHO research in South Africa has shown that many of these gm/ccs are able to thrive under dry (< 500 mm rainfall) conditions and in poor soils. Top performers in a two-year legume screening trial have been lablab, long-duration pigeon pea, horsegram (Macrotyloma uniflorum), and cowpea (dual-purpose, grain/fodder varieties from ICRISAT). Both the vining and bush types of velvet bean (Mucuna pruriens) have also performed well, even though velvet bean reaches its full potential in more humid environments. Where there is too little rainfall to support annual gm/ccs, consider nitrogen fixing trees. Species such as Faidherbia albida can add significant amounts of organic matter to the soil through leaf litter. With sufficient space between trees, various other crops can be grown under the trees in partial shade. Length of the rainy season: Once established, the legume species mentioned above need very little water. They do, however, need adequate soil moisture while still young seedlings. With regards to relay cropping especially, allow sufficient time for the legume to become established. Crop competition: Legumes can actually act as a weed by competing with a grain crop for resources (e.g., light and moisture). To minimize competitiveness of a legume, (1) allow sufficient space between crop and legume plants, (2) plant the legume 3-5 weeks after the grain crop (depending on length of the rainy season), and (3) select lower-growing (e.g., cowpea, horsegram) instead of vining (e.g, lablab, velvet bean) crops. Regarding the third option, realize that lower-growing legumes are not only less competitive than vining legumes but also produce less biomass. Practice: Select annual and/or perennial crops suited to dry climates and that have been proven successful on a large scale. Crops that ICRISAT is focusing on are groundnut (Arachis hypogaea), pigeon pea (Cajanus cajan), pearl millet (Pennisetum glaucum), chickpea (Cicer arietinum) and sorghum (Sorghum bicolor). Other drought-resistant field crops include cassava (Manihot esculenta) and grain amaranth (Amaranthus cruentus). Practice: Integrate annual and perennial crops in agroforestry systems. Figure 7. An example of a Farmer Managed Agroforestry System with multi-purpose acacias and annual crops. Photo credit: Peter Cunningham. Being very biodiverse, agroforestry systems are also very resilient. They are better able than annual or perennial crop monocultures to withstand pests and extreme weather events. They also typically sequester more carbon than monoculture plantings. Annual and perennial crops can be integrated with each other, as well as with animals. Thorlakson and Neufeldt (2012) found that Kenyan farmers involved in agroforestry, and who had mature trees on their land, were able to cope with climate-related hazards by selling byproducts such as seedlings, timber and firewood. 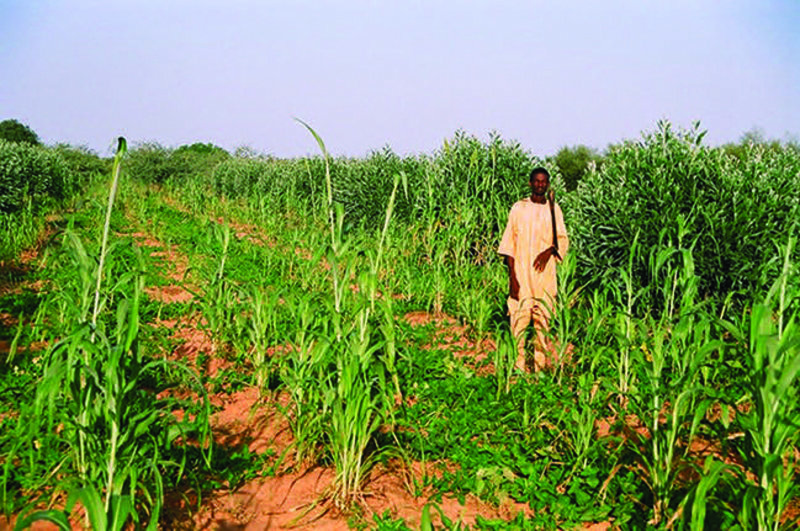 Farmer Managed Natural Regeneration (FMNR) is an agroforestry system that has proven to be a rapid, low cost and easily replicated approach to restoring and improving agricultural, forest and pasture lands. 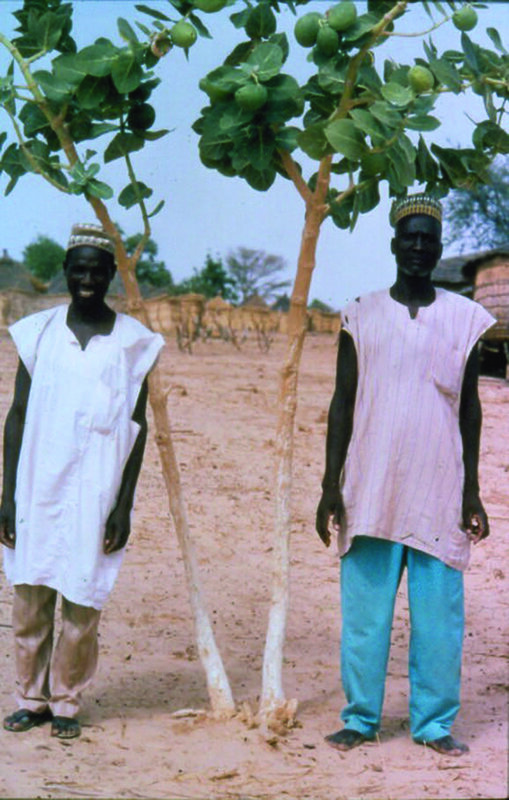 FMNR was originally innovated and promoted in West Africa during the 1980s by agronomist and SIM worker Tony Rinaudo (currently with World Vision). The approach has since spread through many corners of the world and is based on encouraging the systematic regrowth of existing trees or self-sown seeds. It can be used wherever there are living tree stumps with the ability to coppice (re-sprout) or seeds in the soil that can germinate. See TNs, “Agroforestry Principles,” “FMNR,” and “Farmer Managed Agroforestry System (FMAFS)” (Figure 7). Practice: Improve local genetics through crossbreeding with heat and disease tolerant breeds. Since appropriate genetic resources for increased heat and disease tolerance may include hardy local breeds, non-governmental organizations and other development agencies can play a role in inventorying and preserving local livestock biodiversity. Additionally, they can help access new, suitable breeds from elsewhere. Practice: Use of shade cloth or similar plastic mesh, which can be hung around animal facilities (e.g., pig pens) to block the sun and exclude insects. Practice: Use of wood vinegar to repel flies and reduce odor (see TN 77). Practice: Ensure that water is available at all times; rainwater harvesting may be applicable. Practice: Establish intensive forage gardens for “cut and carry” livestock feeding systems. Such plantings can sequester carbon and be more productive than pastures during hot, dry conditions. To feed goats, cattle and pigs, poultry and some grass fish, such gardens may be comprised of locally appropriate forage crops such as: napier grass (Pennisetum purpureum), mulberry (Morus spp), large indigo (Indigofera teysmanii; a multi-purpose nitrogen-fixing tree that provides good fodder for livestock), poultry and some grass fish (Nguyen), Leucaeana spp., fleminga (Flemingia macrophylla) and stylo (Stylosanthes guianensis). Practice: Ferment locally-available, perennial plant material for supplemental feed for pigs, poultry and catfish. Use of fermented feed reduces the amount of grains needed and, because no cooking is required, it also saves fuel while reducing the production of GHG. Plant materials can include banana stalks, papaya fruit, and other types of fruit and vegetable material. For an introduction to the use of beneficial microorganisms to produce fermented feed as well as to improve the soil, see “An Introduction to Asian Natural Farming” (ECHO Asia slide presentation) and “Multiplication and Use of Soil Microorganisms” (EDN 110). Figure 8. Regrowth of tree stumps in the FMNR agroforestry system. Photo credit: Tony Rinaudo. Practice: Prevent stocking rates from exceeding the grassland carrying capacity. Practice: Rotational pasture management as a cost-effective way to mitigate GHG emissions from feed crop production. Lands in danger of degradation should be fenced off seasonally and/or until they recover. Practice: Incorporate FMNR (see earlier discussion of agroforestry) as a low input option for improving rangelands. In arid areas where FMNR has been adopted (Figure 8), when pastures are completely depleted by drought, by retaining trees, grazing animals can make it through lean times by feeding on leaves and pods during times that no other food is available. Additionally, as animals spend more time in the shade of trees and in search of falling tree pods, soil fertility on semi-forest pasture increases through their added dung and urine, sequestering carbon in the process. Finally, the shade of trees in the FMNR system also protects pasture grass and other crops from heat and wind erosion. Practice: Sow tropical forage species (grasses and legumes) into grazing lands. According to an International Center for Tropical Agriculture (CIAT) report (Peters et al. 2012), sown forages have tremendous potential to sequester carbon, lower ruminant methane emissions, and reduce nitrous oxide emissions. The report suggests various species and explains how GHG are reduced (see For Further Reading section). Practice: Utilize livestock wastes in large or small-scale biogas systems (see earlier discussion of alternative energy sources). Practice: Utilize animal wastes as manure for crop fertilization, offering another means of carbon sequestration. Animal manures are often collected and placed into planting basins (e.g., in the Zai and Foundations for Farming Systems). Another example is the use of natural bedding, such as rice husks or sawdust, for livestock. After many months of use as bedding, the nitrogen-rich material can be used as compost. Practice: Grow high-value fruits on the top of dykes, consistent with the concept of raised beds for low-lying areas where the water table is high. This keeps plant roots from becoming waterlogged. Practice: Raise fish in the ditches dug to create the dykes, making maximum use of the available water. Practice: Plant mangroves and forest trees around the fish/fruit production area. Restoring mangroves and other coastal forests protects coastal land from storm surges, improves wildlife habitats and biodiversity, and sequesters C.
Figure 9. Fish ponds in series, allowing for independent draining and filling. Photo credit: Dennis Murnyak. Practice: Integrate fish farming into irrigated agriculture (e.g., raise fish while growing rice) and improve aquaculture in reservoirs (International Water Management Institute and the World Fish Center recommendation)–to improve productivity of available water and reduce reliance on native fisheries. 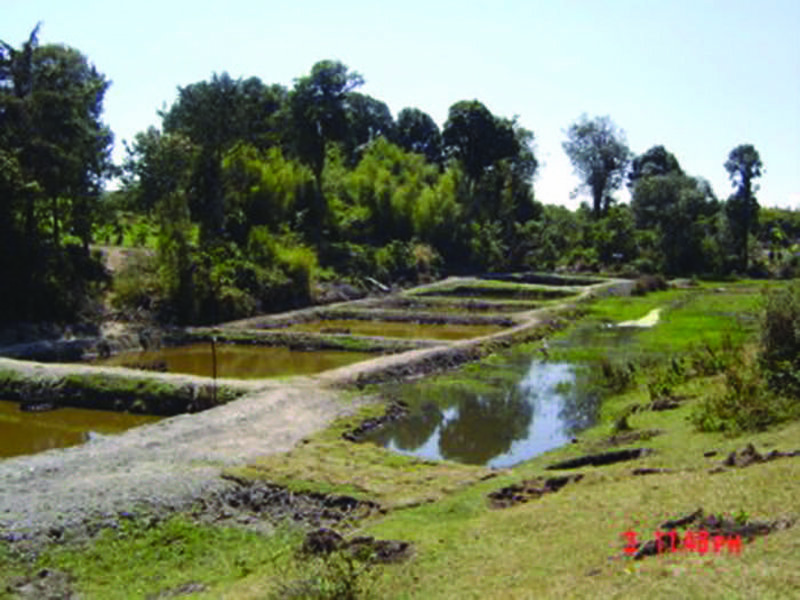 Practice: Increase fish production through the use of small tanks and ponds (Figure 9). See ECHO Technical Note 64, “Fish Farming,” for related information on raising tilapia. Smallholder farming systems in many parts of the tropics are vulnerable to the adverse effects of climate change. Effects include warming of the earth due to GHG, resulting in increased occurrence of droughts, floods and unpredictable rainfall. The practices outlined above are consistent with principles of conservation agriculture, which has great potential to help mitigate against climate change and its harmful effects. This potential was illustrated by Simpson and Burpee (2012) in a talk they presented, summarizing impacts of Hurricane Mitch. That storm, with 180 mile per hour winds, resulted in 22,000 deaths and crop loss for a third of Honduran farmers. In assessing the impacts, World Neighbors and collaborating groups found that there was 58% to 99% less damage on conservation agriculture plots–that had permanent vegetative cover, rotations and soil/water conservation–than conventional plots. Additionally, the conservation plots had 28% to 38% more topsoil and two to three times less surface erosion than conventional plots. This illustrates the power of conservation agriculture to impart resilience of farming systems to weather extremes. We welcome feedback regarding the practices outlined above; see the Publications Forum on www.ECHOcommunity.org. Let us know of your experience with any of these or other practices that you have found to be of benefit to smallholder farmer. Bruinsma, J. 2009. “The Resource Outlook to 2050”, in Expert Meeting on “How to Feed the World in 2050”: FAO, Rome. Calvosa, C., D. Chuluunbaatar and K. Fara. 2010. Livestock and climate change. International Fund for Agricultural Development (IFAD). Rome. FAO. 2010. “Climate-Smart” Agriculture. Policies, Practices and Financing for Food Security, Adaptation and Mitigation. Rome, Food and Agriculture Organization of the United Nations. Harrison, L., J. Michaelsen, C. Funk, and G. Husak. 2011. Effects of temperature changes on maize production in Mozambique. Climate research 46:211-222. Hickman, J.E., M. Havlikova, C. Kroeze, and C.A. Palm. 2011. Current and future nitrous oxide emissions from African agriculture. Current Opinion in Environmental Sustainability 3:370-378.
International Labour Organization (ILO). 2008. Cyclone Sidr: Preliminary Assessment of the Impact on Decent Employment and Proposed Recovery Strategy. Geneva: ILO, 2008. O’Gorman, P.A. 2012. Sensitivity of tropical precipitation extremes to climate change. Nature Geoscience 5:697-700. Peng, S. J. Huang, J.E. Sheehy, R.C. Laza, R.M. Visperas, X. Zhong, G.S. Centeno, G.S. Khush, and K.G. Cassman. 2004. Rice Yields Decline with Higher Night Temperature from Global Warming,” Proceedings of the National Academy of Sciences, 6 July 2004, pp. 9971–75. Peters, M., I. Rao, M. Fisher, G. Subbarao, S. Martens, M. Herrero, R. van der Hoek, R. Schultze-Kraft, J. Miles, A. Castro, S. Graefe, T. Tiemann, M. Ayarza, and G. Hyman. 2012. 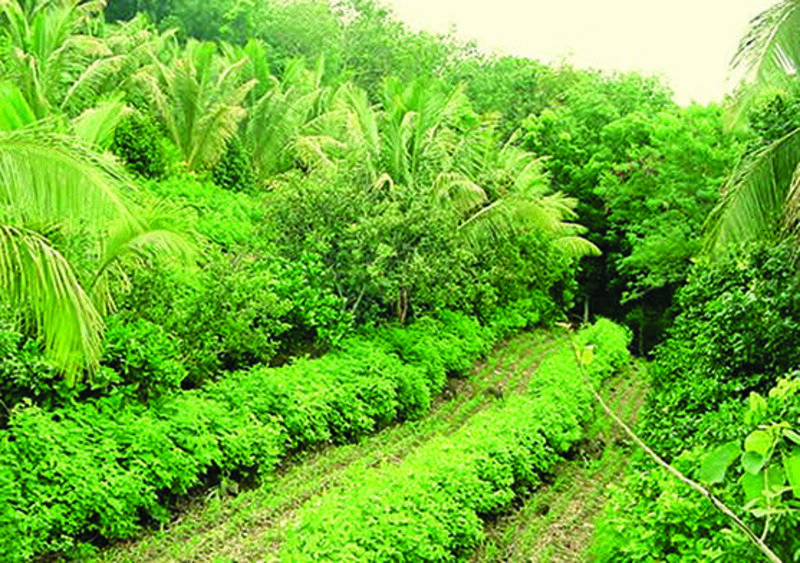 Tropical Forage-based Systems to Mitigate Greenhouse Gas Emissions. In: Eco-Efficiency: From Vision to Reality (Chapter 11; http://ciat.cgiar.org/new-publications/). Syakila A, Kroeze C: The global N2O budget revisited. Greenhouse Gas Measurement and Mitigation 2011, 1:17-26. United Nations, Department of Economic and Socal Affairs, Population Division. 2011. World Population Prospects: The 2010 Revision, Highlights and Advance Tables. Working Paper No. ESA/P/WP.220. World Bank. 2012. Regional Highlights World Development Indicators. ECHO publications referred to below are abbreviated as EDN (ECHO Development Notes), AN (Asia Note), or TN (Technical Note). These documents are available as pdf files to registered members of ECHOcommunity.org. Technical Notes and EDN issues can be found on the website by clicking on the “Publications” tab of the ECHOcommunity home page; AN issues are found by clicking on the “Asia Impact Center” tab, and then on “ECHO Asia Notes and News.” ECHO documents are freely available to registered members of ECHOcommunity.org; click on “Register” for information on how to register, free of charge, for basic membership or membership as an agricultural development worker. In addition to ECHO publications, links are listed below to numerous other publications from other organizations. The Handbook of Utilization of Aquatic Plants (FAO Fisheries Technical Paper No. 187), http://www.fao.org/docrep/003/X6862E/X6862E00.htm#TOC, is an authoritative reference on various aquatic crops grown for consumption by humans and livestock. See ECHO Appropriate Technology Technical Notes on topics such as methane digesters (biogas) and fuel-efficient cookstoves. “Mulberry: an exceptional forage available almost worldwide!” (FAO bulletin) http://www.fao.org/ag/AGA/AGAP/FRG/Mulberry/Papers/HTML/Mulbwar2.htm.